If you’re headed to your local cineplex to see “Pacific Rim” this weekend, you already know why you’re going: to see monsters fighting robots, and that’s hardly an oversimplification. Not that the film isn’t great fun; prodigious visual effects make this the stuff summers were made for. It’s the old game Rock ‘Em Sock ‘Em Robots on some serious steriods, sure to please your average 12-year-old boy. What’s unexpected – and frankly, refreshing – are the casting choices. We’re so accustomed to the Hollywood “lead” types that anything outside the standard can seem strange. The three main characters in “Pacific Rim,” the action blockbuster that opens Friday nationwide, are played by men who are Caucasian and African American and one woman, Japanese star Rinko Kikuchi. In the movie, set in the near future, Earth is besieged by enormous monsters who, after being dormant in the planet’s core for millions of years, are emerging through cracks in the mantle and wreaking havoc on the surface. To combat these behemoths, called “kaiju” after the Japanese word for monster, the nations of the world have joined forces and built an army of huge, human-controlled robots. 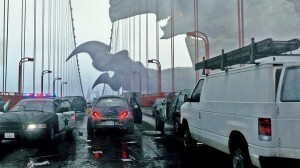 Well, at least BART is running–Traffic is snarled on San Francisco’s Golden Gate Bridge, thanks to one of them pesky kaiju. Because of the intense brain power required to control a robot – named “Jaeger,” the German word for hunter – a team of two are needed to operate the fighting machines. 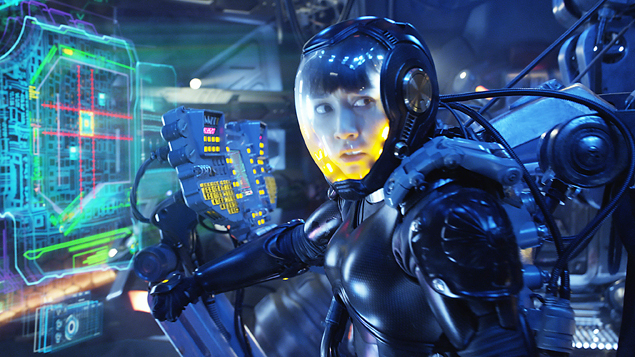 Kikuchi plays Mako Mori, who as a child lost her parents in a kaiju attack, giving her a deeply personal incentive to become a Jaeger pilot. The role, though make-believe, is an intensely physical one, and Kikuchi reported that the preparation made her feel like she was being readied for actual battle. “The training included weight lifting, running and a boot camp at the beach,” she explained. “I worked out at the beach and gym, five times a week, making my body bigger and building muscle. Kikuchi said once the training was completed, actually operating the harness through which the robots are controlled was truly a physical challenge. “First of all, the armored suit was extremely heavy. It was like wearing dumbbells on both arms and legs,” she explained, adding her martial arts scenes in the film also took their toll. Kikuchi said the film posed a bit of a language challenge as well. While she is quite fluent in English, acting in her second language has different expectations from daily conversation. “Pacific Rim,” rated PG-13, opens nationwide on Friday. Idris Elba is British, not American.